I’m not sure what to make of this graphic novel. Let me start by saying that I’m generally a Green Lantern fan. I really enjoyed the Green Lantern (and “/Green Arrow”) books when I was a teenager. The only comic that I bought regularly in the past fifteen years was the Green Lantern “Blackest Night” series, and sometimes I feel like I’m the only person who actually liked the Green Lantern movie. So with that in mind, it might come as a surprise that I actually did not like this particular graphic novel. My immediate reaction was that this was dull. It felt like a short story that was expanded too much, just to sell more issues. Basic plot(s): Guardians have lost their colective minds and whatever compassion they may have had left. Create a new race of beings in order to cleanse the universe of inferiority (okay…ethnic cleansing storyline…got it). New race invades, inhabits, takes over. Battle ensues. Repeat. Meanwhile…on another system…Green Lanter, Kyle Raynor, is trying to be the first Lantern to absorb the knowledge and power of all the different colored Lanterns. Approach power source. Learn lesson. Repeat. I do have a few other ‘issues’ with the series. First it’s the Guardians themsevles. I’ve never been a particularly big fan of the Guardians, but have always recognized their role in the creation of the Lantern Corps. I also recognize that the Guardians are capable of ‘going bad,’ but without an outside source controlling them, how is it that they all managed to come to the conclusion that genocide is the appropriate means to creating order? And while there could be an outside force controlling them… really? the Lantern Corps couldn’t protect the guardians? Next…still another human becomes a Green Lantern. 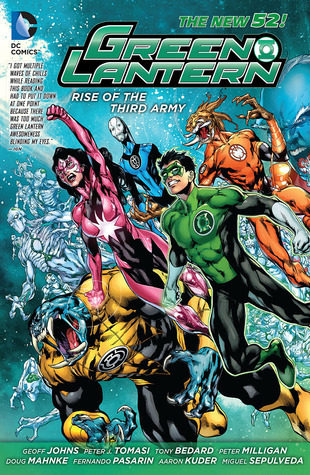 Apparently we can’t come up with enough interesting stories for the five existing human Green Lanterns? We need another? This one even more unlikely hero than those unlikely heroes before him? And despite having his ring for all of ten minutes and not sure quite how to weild it…he manages to stave off the entire Justice League? Credibility stretched. The ‘third army’ is too much a cross between “The Walking Dead” and Star Trek‘s Borg. On the positive side…the art is pretty decent, despite the plethora of artists on the book. The cover concepts are fun to see. The stakes in the story are high (anyone reading my blog will know this can be an important factor for me), and … well… it’s still Green Lantern… one of my favorites. if you’re a Lantern fan, or a comics fan, you might enjoy this. If you are new to the character or the format, there are better choices for an introduction. Looking for a good book? This is good, but not as an introduction to the characters or format.